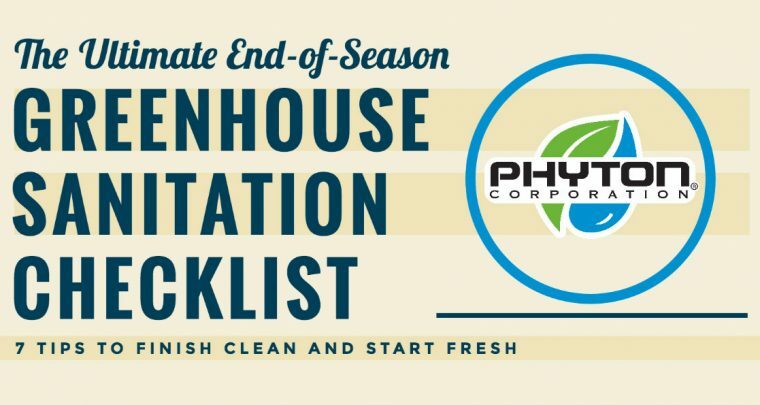 With the busy spring season coming to a close, now is the perfect time to start thinking about cleaning, sanitizing, and organizing your greenhouse. Finishing clean will help keep diseases and pests from harboring in your greenhouse, making for a smoother start to your next crop cycle. Getting organized and making sanitation-friendly improvements during a break in your crop cycles will pave the way for future success. We’ve put together a handy infographic checklist you can follow to whip your greenhouse into shape. Each item on the list will take you one step closer to winning the battle against pests and diseases by making your greenhouse an inhospitable place for them. You’ll make it harder for them to survive and harder for them to get in or stay in, while at the same time making sure your equipment is performing at its best, which will also help keep pests at bay. You’ll take the steps you need to stock and prepare your arsenal of chemicals and gear so that you are always ready for battle and won’t fall prey to costly delays in treatment. In the end, you’ll reduce your exposure to pathogens and in turn save money on greenhouse chemicals, all the while producing healthier, more robust plants that will boost your sales. A true win-win!